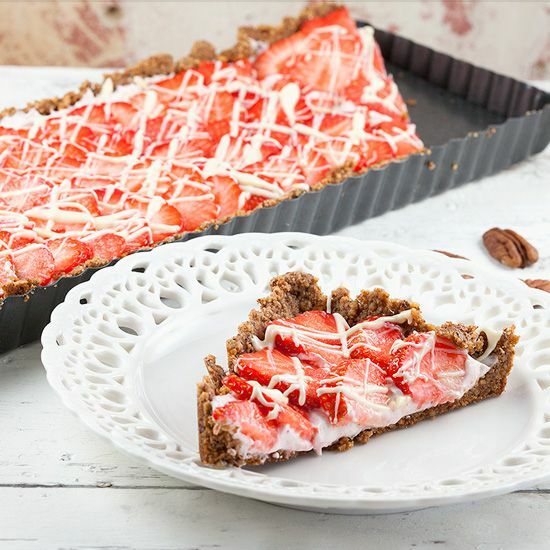 Very refreshing strawberry-pecan pie made from scratch and done in half an hour. So much flavor for so little time, don't you just love that? MELT the butter in a small saucepan. PLACE the pecan and walnuts in the food processor or blender and grind them as fine as you possible can. Slowly ADD the melted butter and 2 tablespoons of powdered sugar and mix until it comes together. COAT the rectangle pie pan with butter and divide the pecan mixture evenly over the pie pan. PRESS downwards with your hands so the pie crust is thin enough. BAKE the pie crust in the pre-heated oven for about 10 minutes, depending on your oven. The butter in the crust will start to bubble, but that’s okay. Let it cool off completely. The filling is very easy. COMBINE cream cheese, mascarpone and 2 tablespoons of powdered sugar until you’ve reached a smooth mixture. DIVIDE the mixture over the pie crust. 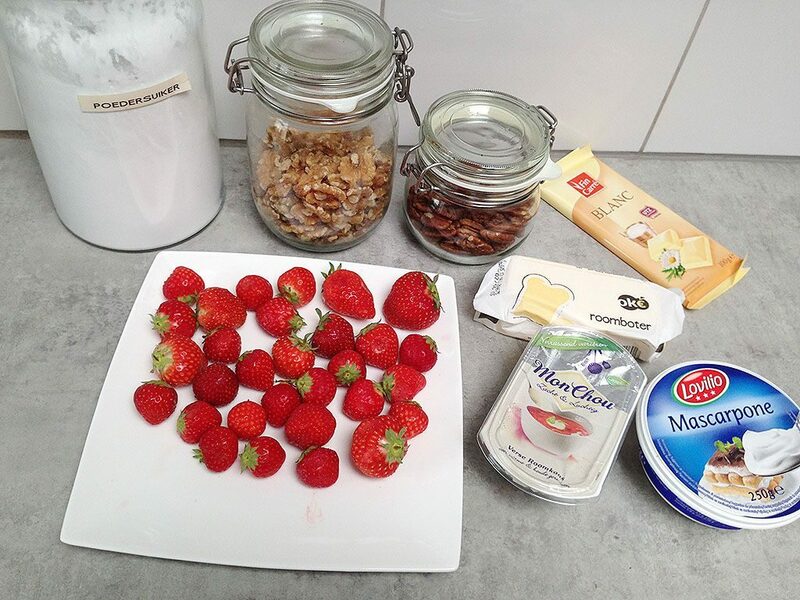 RINSE the strawberries and remove the stems. 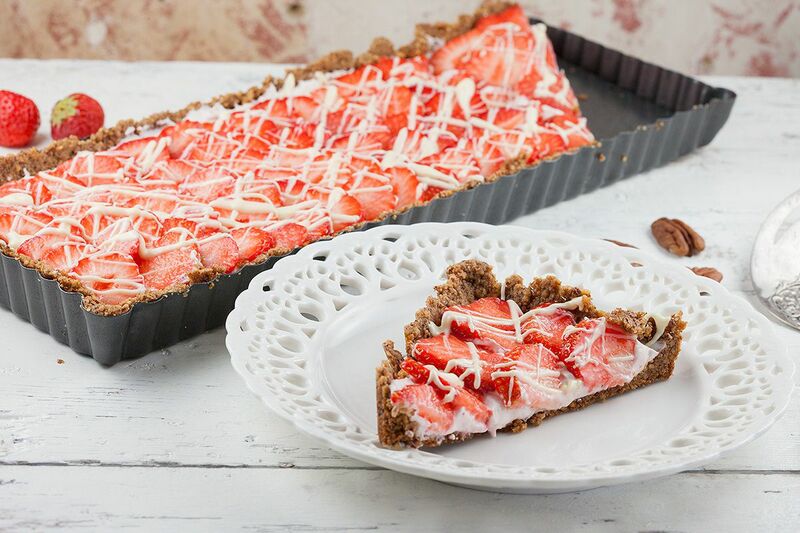 CUT the strawberries into slices and divide over the pie. ADD small pieces of white chocolate into the bowl. FILL a small layer of water in the saucepan you used before for melting the butter and heat on medium heat. PLACE the bowl on top and the steam from the boiling water will melt the chocolate using the bain-marie method. 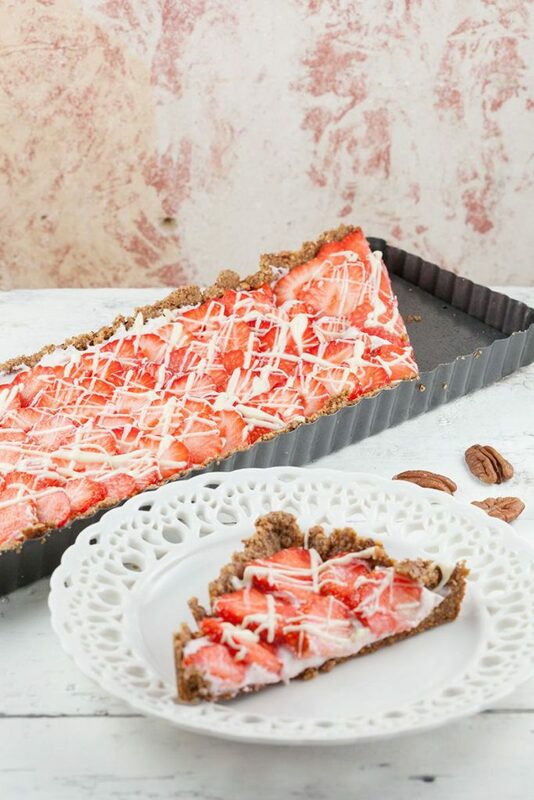 DECORATE the pie with white chocolate and enjoy!